I'm in shock about a couple of things from this outfit. A) Can you believe that I haven't worn this dress in about a month? I honestly think the last time was Halloween. I mean, over the summer and last year at work I wore that dress at least once a week, if not twice (in the summer). But in completing-dissertation phase, the dresses sit quietly in the closet. B) Why did I never think of layering this top under this dress? I could've forsworn my constant cardigan and looked cute with an ersatz long-sleeved dress and no one would've been the wiser! C) This is the first time I've ever tied the bow from the dress' sash on the front (barely visible because of my black on black) and I'm really glad I tried that. I lost a bit of the nice natural pleating that the dress boasts, but I also didn't feel as if I had a huge knot in the small of my back every time I sat down. To put it simply? This dress was a winner for me. Coupled with colorful tights and comfy tall boots, I was very happy with my Saturday choices. 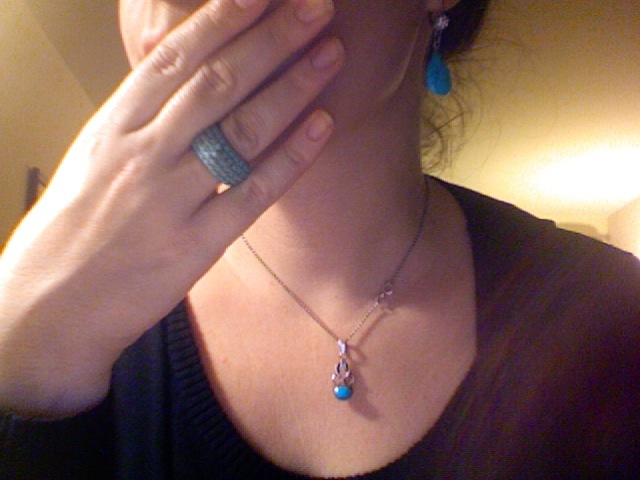 Because I was wearing colorful tights, I decided to give in to my matchy-matchy instincts and wear turquoise jewelry [I don't have any jewelry in teal that I know of]. Behold! Exciting and not too obvious... which means there's something missing. Hmmm, what could I do to punch this up, especially since my wool coat is grey? I know! A bright scarf! How 'bout them colors? This scarf was hand-knit for me by a good friend from grad school. I love that it incorporates turquoise (the reason I wore it with the earrings and tights), orange, white, purple, reds, etc. in bright, contrasting colors for a loud, non-subtle effect. It was just the accessory I needed to punch up my outfit while wearing a coat over it. The rest of the day was spent in a state of febrile excitement. We decided to finally use a cocktail recipe book we'd received years ago, so we bought some liquor and started mixing some tropical drinks. Because we were so tired, though, we ended up falling asleep of the TV (sense a theme?) with barely our second drink started. I forced myself awake to watch "SNL" a few hours later to see Paul McCartney and then I dragged us both to bed. Um, do you think we need to get out more? Get out more? Of course not! As I soon as I read cocktails and SNL, I was like "sweet!" Anyway, I really like the colourful scarf and overall look of the dress and boots with brigh tights. Very spiffy! I have one last Christmas present to buy. Score. But the problem is that we fell asleep hours before SNL even started. THAT's the problem. And, um, wow, it's cold. I went out for a run this morning and regretted it soon after exiting the building. Hunkering indeed should be the plan.